In this article, I will demonstrate how to work with ViewModel using JQuery Ajax and Strongly Typed view. 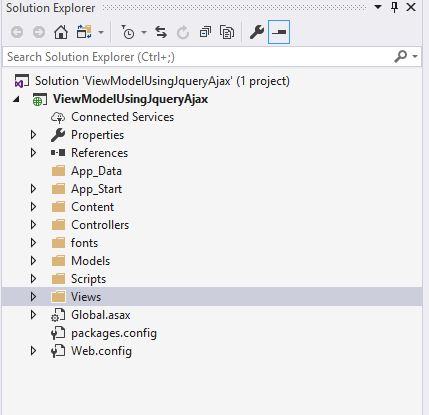 In this article, I will demonstrate how to work with ViewModel in ASP.NET MVC5 Using jQuery Ajax and Strongly Typed View. After going through this article, you will get the benefits of ViewModel features. Okay! Let's move forward. To create ASP.NET MVC empty project, follow the below steps one by one. Here, I have used Visual Studio 2013. Select New Project -> Visual C# -> Web -> ASP.NET Web Application and enter your application name. Here, I named it as "ViewModelUsingjQueryAjax". ViewModels allow you to shape multiple entities from one or more data models or sources into a single object, optimized for consumption and rendered by the view. With the help of ViewModels, we can work with multiple models in a time. To create a View Model we must have more than a model or entity in our project. So, now let's create the model first. In the below, you can see that I have created two models with the name of Employee and Contact. These are the normal model or entity. Now let's create a ViewModel. In the below code you can see that I have created aEmployeeContact_ViewModel. While creating a ViewModel, we have to mention which model or entity should exist in ViewModel. Before Adding dummy values to it, let's create the controller and action. Now, create an empty Controller and View. Here, I created a Controller with the name of "DemoController". Whenever we create an empty Controller, it is created with an empty Index action method. And I have created a LoadEmployees Action. To know about Strongly Typed View refer here. Likewise, I have created a strongly typed view below.
}) < /div> < /div> < div class = "form-group" > < div class = "col-md-offset-2 col-md-10" > < input type = "submit"
You can see that I have created the button with a type of submitting. So, here we can directly pass our view data to the controller using a strongly typed view. And create a post action in a controller. First, we will change the button type because we need to call our jQuery function right? Otherwise, it automatically calls the post action while we have the strongly typed view. So, I have changed the type="submit" to type="button" as below. Now let's write the logic to fetch the value from our view controller. We can get nested class properties id in jQuery, using “@Html.IdFor()”. In the following way, we can read nested class properties value. Or we can define the id for our control and get the value by directly mentioning the control id. In the below code, we have created two objects with the name of employeeDetails, contactDetails and we assigned the value to it. Each and every model object should match here otherwise we will not get the data in our controller.
}) < /div> < /div> < div class = "form-group" > < div class = "col-md-offset-2 col-md-10" > < input type = "button"
Refer to the attached project for reference and I did attach the demonstrated project without package due to the size limit. In this article, we discussed how to work with ViewModel in ASP.NET MVC5 Using jQuery Ajax and Strongly Typed View. I hope it will help you out. Your valuable feedback and comments about this article are always welcome.